Kids Need Freadom® "Kids Need Kiwanis!" A Baby, a Drink (juice! ), a Mom, and a Basket of Books. Our recent distribution of bountiful baskets of books pictures the first of many enjoyable moments for one of our new families in our Freadom® Families program. In collaborative partnership with family support organization Family Focus Englewood, families – with at least one child ages birth to three – regularly receive attractively arranged baskets of books, book character dolls and other educational materials designed to create a literacy-rich environment in the home and a love of reading in the child from the earliest years. A child’s love of books, books in the home, and parents who read are predictors of the child’s future success in school. School success, in turn, is a predictor of a child’s escaping the lure of gangs, crime, and entrapment in the cycle of intergenerational incarceration. 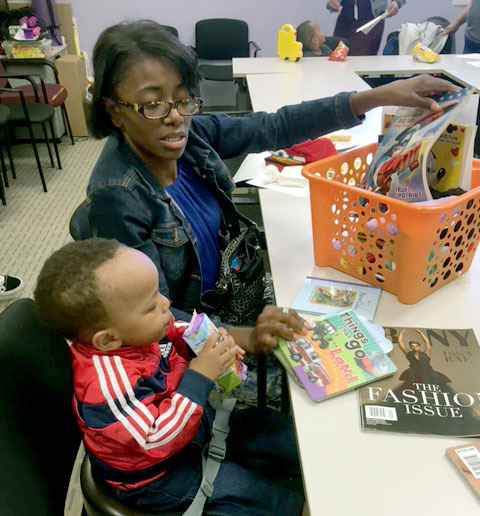 Our Freadom®Families Program is part of Kiwanis International’s YOUNG CHILDREN PRIORITY ONE Program. Major funding is generously contributed by Kiwanis Club of Lakeview – Chicago.